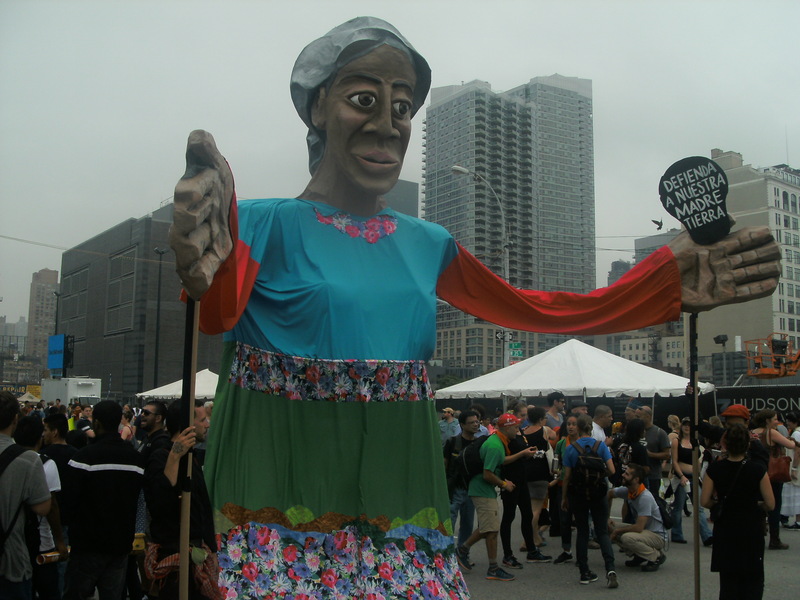 Historic climate justice march in NYC surpasses expectations! The indigenous were in the front of the march and we started off at 11:30 sharp. It was a massive, glorious march with the avenues and streets full up as far as the eye could see. The moments of silence a minute to 1 p.m. followed by a full minute of full volume cries of alarm about the crisis of Mother Earth wer unforgettable. The diversity and creativity of the marchers was beyond description, and the overall mood was upbeat, inspired and joyful. We ran into comrades of struggle, delegations of women from Central America and Asia leading chants together, Buddhist monks from Asia drumming with whom I drummed for a while too, Big banners read: Indigenous Rights are Good for Everyone! We were shocked upon arriving at the end point of the march at around 2;15 p.m. to hear that the last ranks of the march had not even left the starting point! Large screens projected images of marches happening around the world, from Melbourne to Tokyo, from New Delhi to London, etc… Some 2,640 events around the world had been identified. Event organizers estimated the numbers of marchers at 400,000. 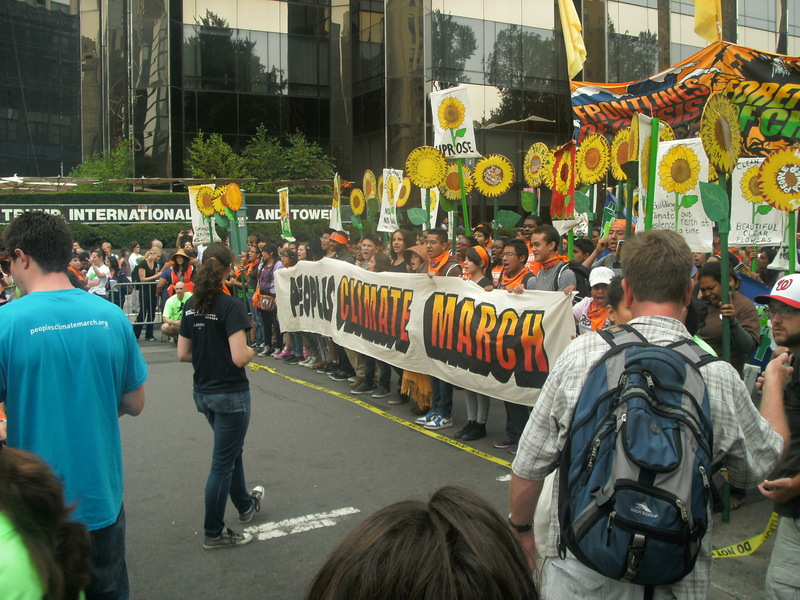 Even splitting the difference, we were a crowd more or less of 345,000, the biggest climate justice march in history! As we sat on the large stretch of 11th Avenue afterwards, some of us decried the position of the US government toward the official talks at the UN on climate, the announcement by President Obama that since something more substantive could not be agreed upon, at least there would be goals set to be achieved voluntarily. This is actually a deep betrayal to the people of the world, continuing decades of foot dragging by the U.S., the largest historical emitter of greenhouse gases in the world. One idea that emerged: why should we allow crimes committed against Mother Nature to go unpunished? Given the severity of climate chaos already upon us, why should we not define all crimes against Mother Nature to be Crimes against Humanity, and have them brought to the International Criminal Court in the Hague? ← Testimonies of courage at Defense of Water Rights workshop bring tears, inspiration!